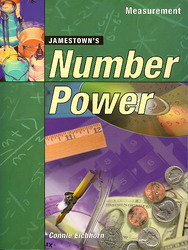 Every Jamestown Number Power book targets a particular set of math skills with straightforward explanations, easy-to-follow, step-by-step instruction, real-life examples, and extensive reinforcement exercises. Use these texts across the full scope of the basic mathematics curriculum, from whole numbers to pre-algebra and geometry. Measurement reviews length, angles, weight, temperature, capacity, volume, time and velocity. Both customary and metric units are covered.